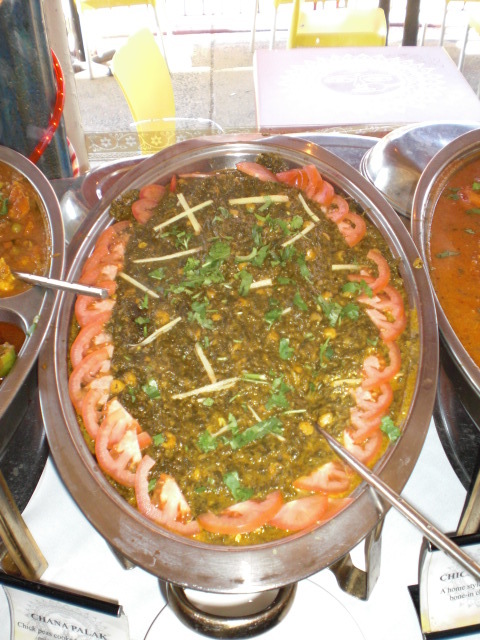 Karma Kafe is one of the first Indian Restaurants to open in the Mile Square City of Hoboken, New Jersey and one of the first to bring the “All You Can Eat” Lunch Buffet to town. Karma Kafe is a favorite among locals and New Yorkers coming from across the Hudson River via the Path Train. Hoboken, New Jersey is known for Frank Sinatra, the first recorded game of Baseball being played, the invention of the Zipper and the illustrious title of Most Bars Per Square Mile over any other city in the United States of America along with so many restaurants. 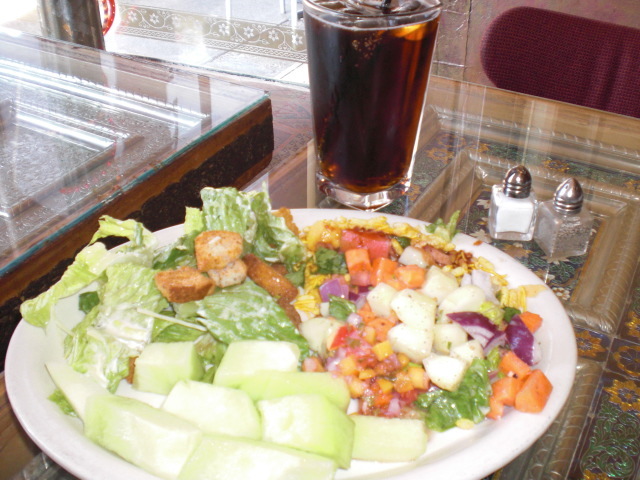 Karma Kafe is located along Washington Street established in 1999 and has a full service bar serving. It’s a very intimate setting with brass temple bells and custom made tables, textured walls and maple hardwood floors. There is an outside dinning area for the better weather days. 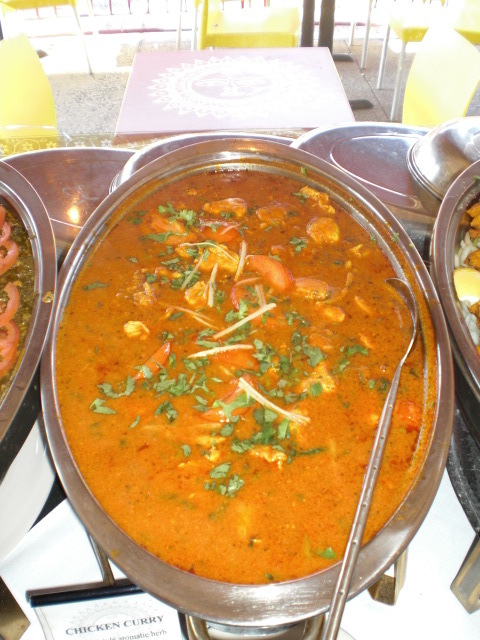 These dishes full of cream sauces and Indian spices can be catered if need be. Me and my dinning partner showed up just in time for the All You Can East Lunch Buffet, which runs Weekdays from 12:00pm to 3:00pm and on Weekends from 12:00pm to 4:00pm. 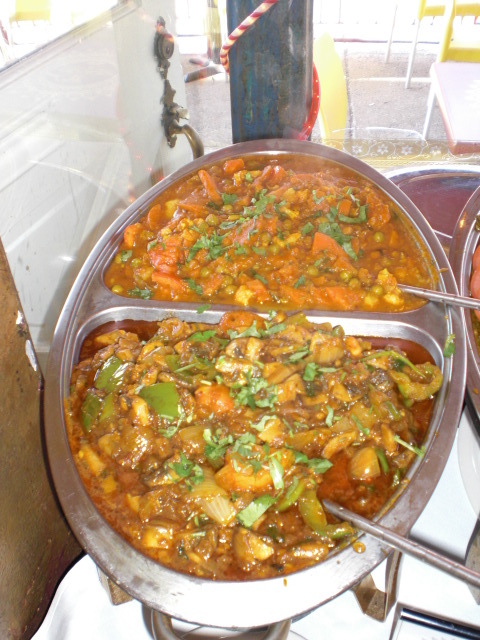 For $9.95 you get an array of rich, traditional and some not so traditional foods from the land of the Taj Mahal. 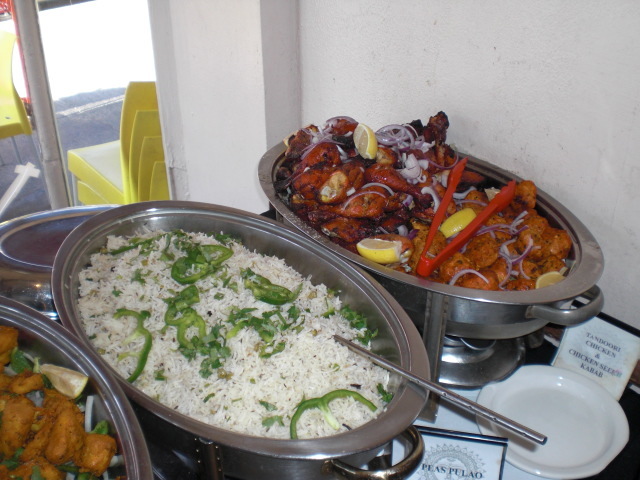 The Lunch Buffet included a large selection of Vegetarian and Non-Vegetarian Entrees with Tandoori Breads, Basmati Pulao Rice and a fresh assortment of Salads and Condiments. 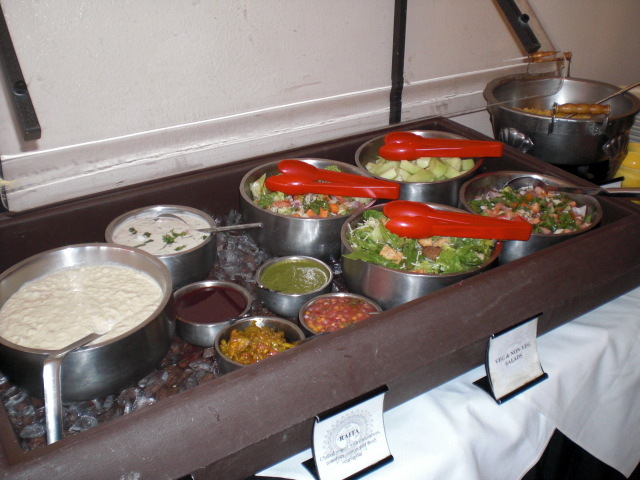 Today they were featuring Karma Aloo (Sauteed baby red potato wedges served over a chilled tomato and garlic reduction), Malabar Vegetables (Medley of veggies in a richly flavored coconut garlic sauce), Curry Chicken, Tandoori Fish, Tandoori Chicken, Indian Caesar Salad, Chana Kachumber Salad (Seasoned chick peas, diced cucumbers, peppers, carrots and tomatoes, in a lemony coriander dressing), Basmati Rice, fresh Honeydew, Naan & the best dessert of Kheer (Traditional rice pudding) among other items. Or course our eyes were bigger thank our stomachs. The wait staff is very attentive, as soon as your glass of water was put down empty it was re-filled with crisp cold lemon water. 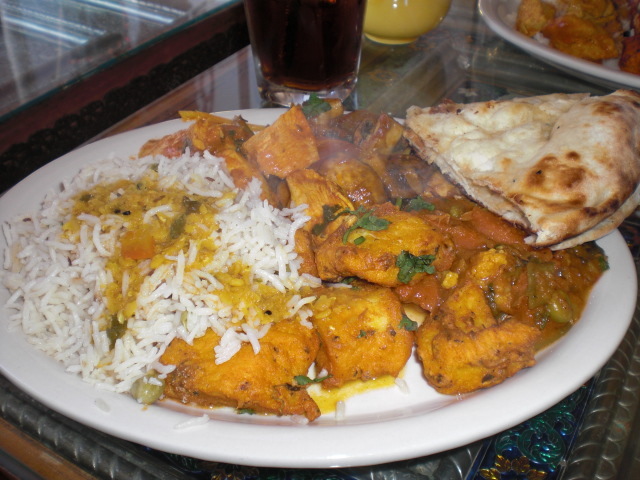 I’ve been here several times and here are my suggestions if you visit for dinner. 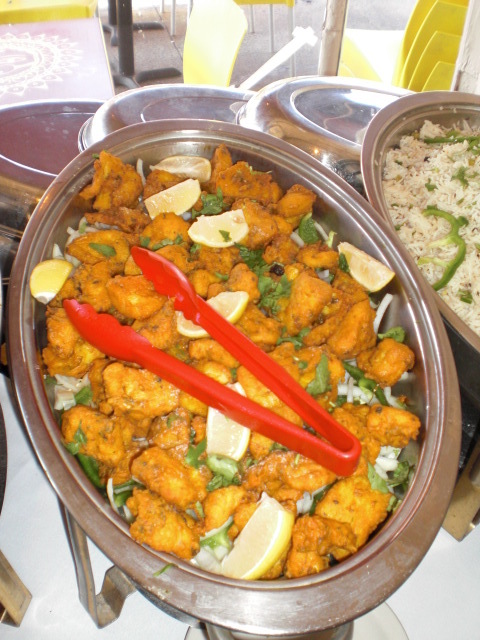 For $9.00 you can get the Bombay Shrimp (Marinated jumbo shrimp lightly battered with season chick peas flour, served with a zesty tomato sauce), for $5.00 The Karma Nann (Stuffed with chicken, mozzarella cheese, onions & garlic), for $15.00 The Koliwada Fish & Chips (Lightly battered fish and seasoned fries), for $10.00 The Bhindi Aloo (Okra adn potatoes sauteed with tempered mustard seeds, and for dessert try for $5.00 The Ras Malai (Chilled sweet cheese dumplings in a cardamom infused milkey syrup. You can visit their website at www.karmakafe.com , and after your done stroll down a couple of blocks to 95 Washington Street home of Carlos Bakery and get some of the best Italian Pastry you’ll ever try. Karma Kafe is Zagat rated.